Catholic faithful from across Italy have been travelling to a small town near Naples to see a Madonna statue believers say has taken human form. Witnesses say the plaster statue in the church of St Peter's in Acerra turns flesh-coloured and moves. They describe the Madonna becoming a "pinky colour" and say they captured the event on a mobile phone camera. A local bishop has said he is sceptical but will look at all the evidence provided before making a judgement. One woman described how she saw "the ear lobe extend and become flesh, just like the nose, which turned a pinky colour", according to Italian news agency Ansa. Another man, 45-year-old Domenico, said, "The legs gradually became more prominent and then the knees moved forwards, until they stretched out the folds of the white dress." Bishop Giovanni Rinaldi said he had visited the modern church to examine the statue. "I looked at it from various angles, moving from one room to another," he told Ansa. "I noticed that it changed colour depending on the light and shade, becoming pinky, almost as if it were flesh," he said. The Vatican very rarely approves miracles, despite an increase in the number reported. 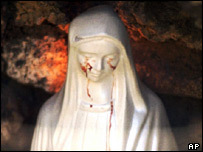 In 1995, a Madonna statue in the town of Civitavecchia, north of Rome, was reported to be crying tears of blood, prompting a flood of interest. But, after a lengthy investigation, the Vatican failed to pronounce it definitely authentic. Since 1905, the Vatican has approved only 12 miraculous events and rejected 284.